Need Christmas gift ideas for a newly engaged or married couple? 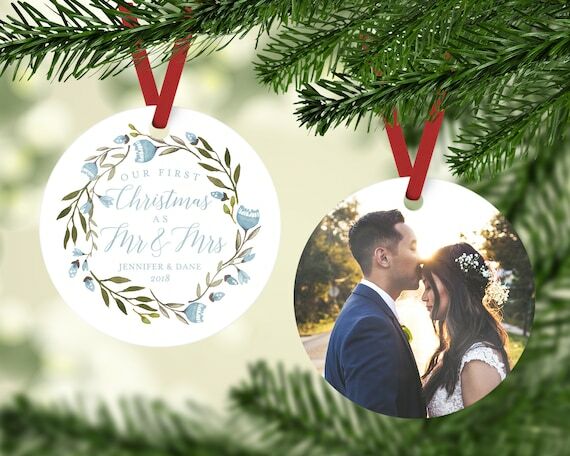 What better way to commemorate their special day than with one of the year’s top newlywed ornaments and gift ideas? 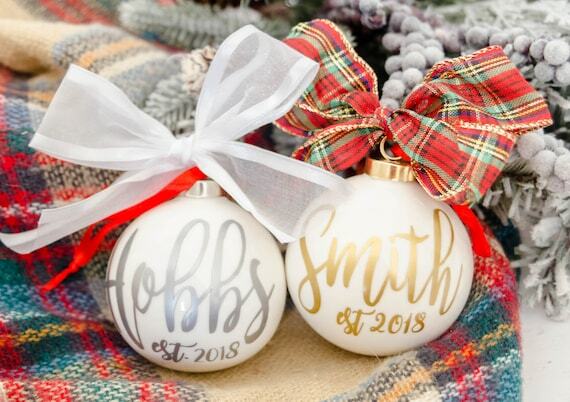 Below, I’ve listed my favorite picks for newlywed ornament ideas that you can find on Etsy! 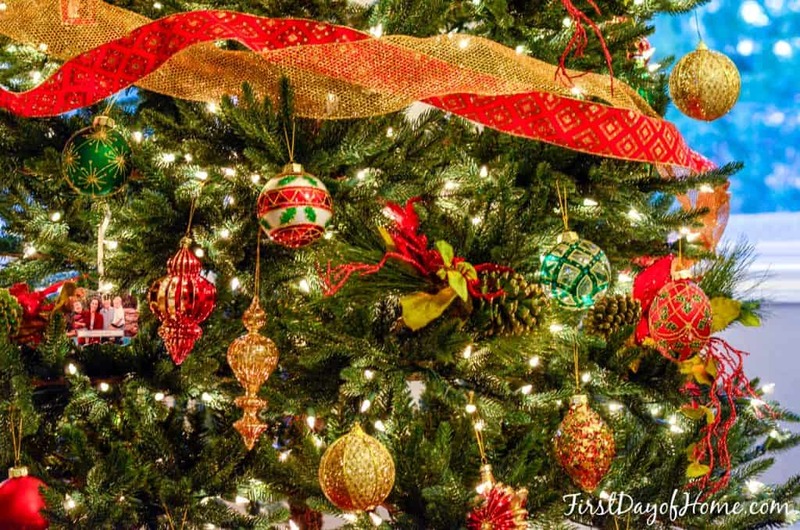 At the end of this post, I’m also including a few great gift suggestions beyond ornaments. Do the newlyweds like the farmhouse feel? Are they modern or classic? Do they have a color scheme for their Christmas decor? What is special or unique about the couple? When searching for the perfect newlywed Christmas gift, it also helps to answer the following questions. 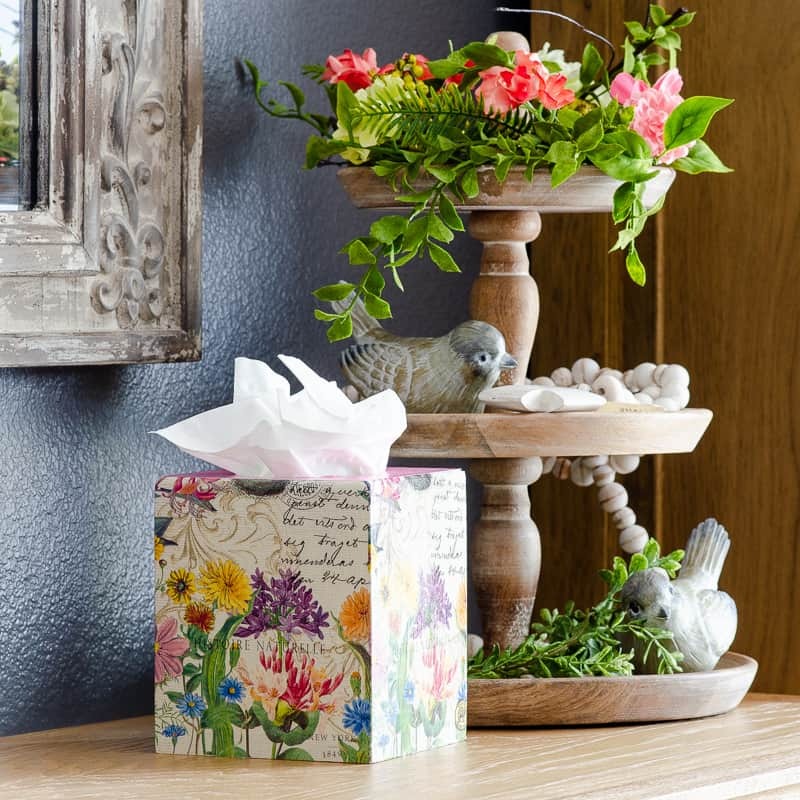 These may spark an idea for a unique and thoughtful gift. Did the newlyweds have a special destination wedding or location where they met? Does the couple have a new home? 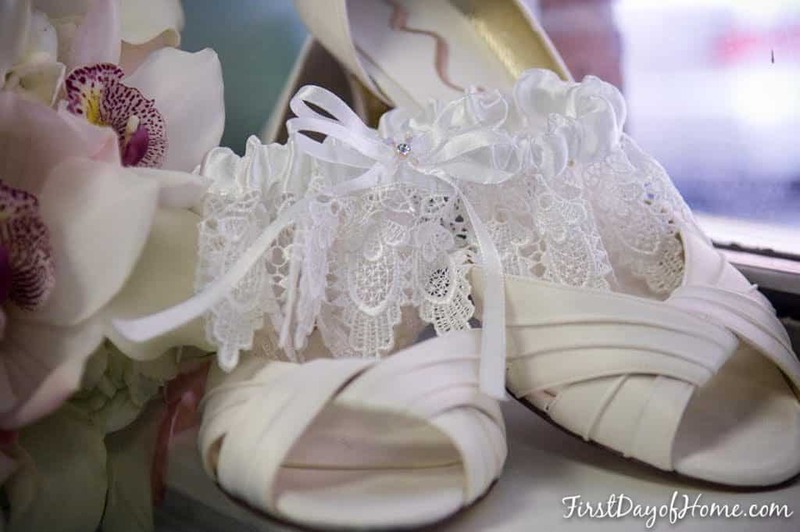 Does the bride or groom have a special hobby that you can incorporate? Does the couple have any honeymoon plans? 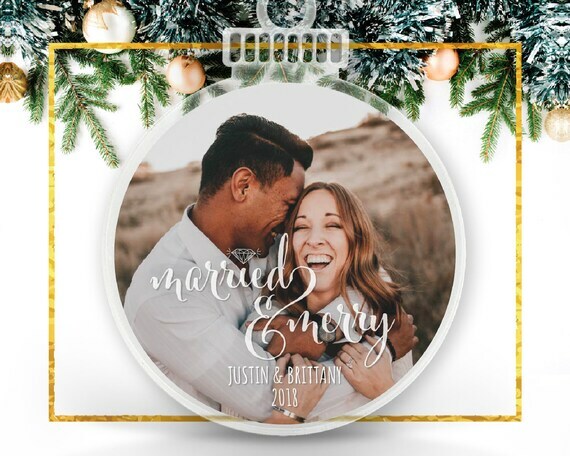 If you’re hoping to personalize the ornament with a photo, request the photo from the couple soon. You’ll need to upload the photo to your chosen Etsy shop and factor in processing and shipping time. One of my favorite ways to honor newlyweds is with a portrait gift. Many Etsy sellers offer portraits with photos or cartoons/caricatures that you can customize. Here’s a “married and merry” tree ornament with a whimsical, yet simple design…easy to please most couples! 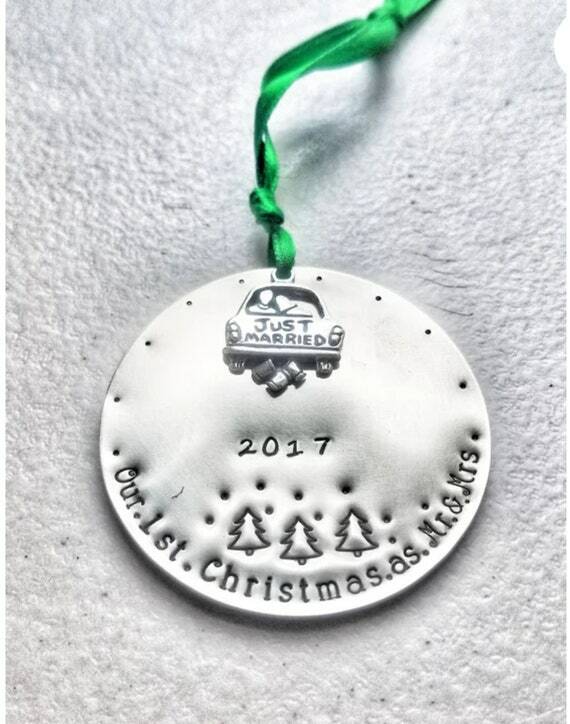 This particular Etsy shop has multiple formatting options, and the ornaments are double-sided and shatterproof. I also love this little newlywed number, which is a bit more feminine. I’m always a fan of the “less is more” approach if the couple is more traditional with their Christmas tree ornament decor. The ornament below comes in aluminum or ceramic. I have to say, this one is my faves. 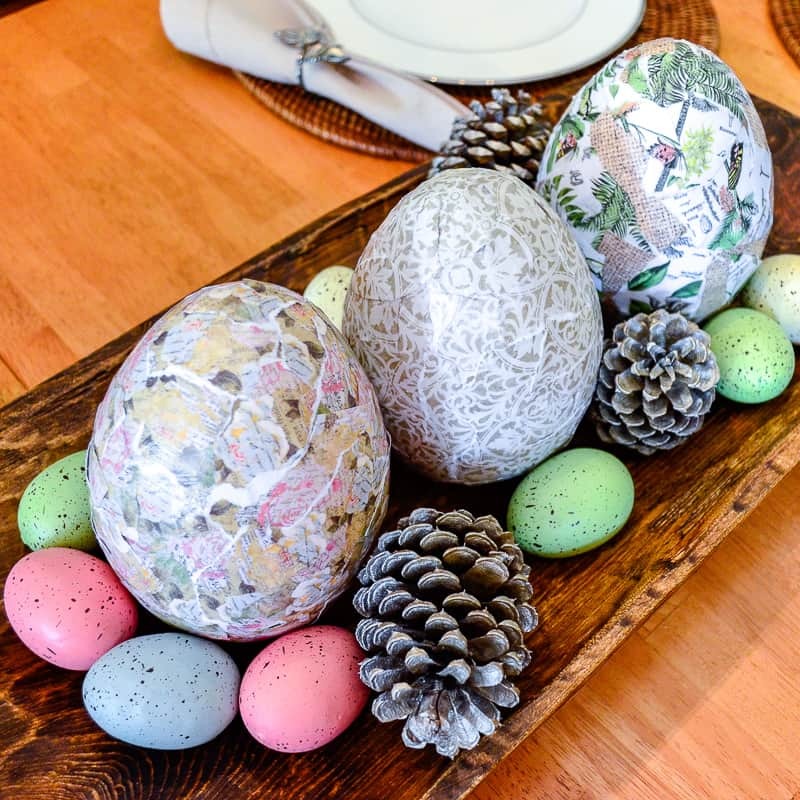 It comes double-sided with a sweet, farmhouse-style design. I love the laurel border. 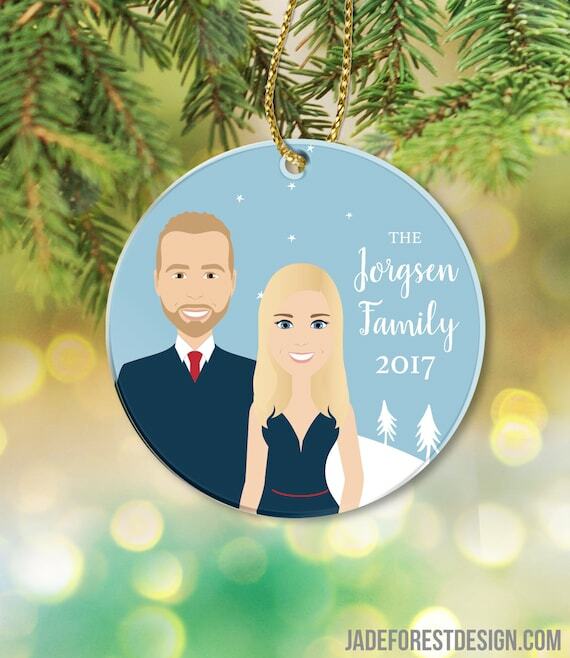 Jade Forest Design offers the ornament below with adorable caricatures for newlyweds. The shop has a 5-star rating with over 2,200 reviews. I wonder what my hubby and I would look like in our caricature version…hmmm. 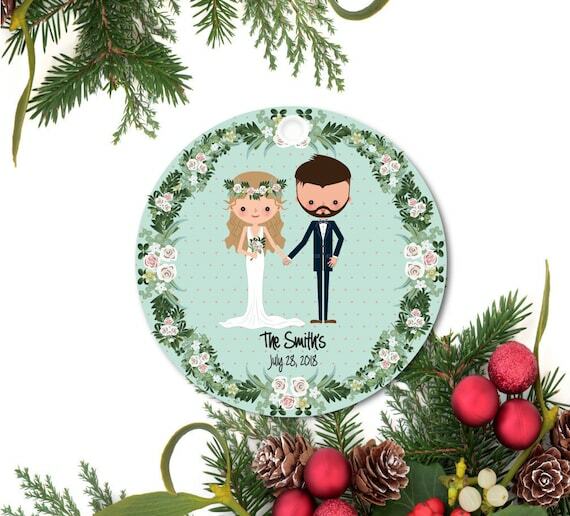 I love the cartoon-ish style of the newlywed ornament below. This shop can customize the features of the newlywed couple down to facial hair and glasses. If you think your intended gift recipients would prefer a simple text style (or if you don’t have a photo available), try these ornaments on for size. 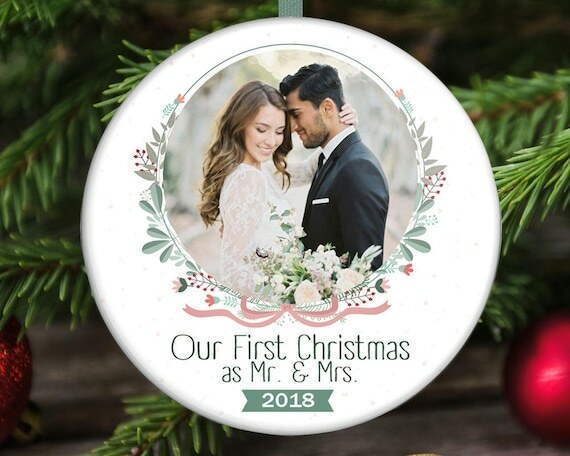 Esty offers ceramic holiday ornaments personalized with the bride and groom’s name and year or with a simple “Mr. and Mrs.” text. 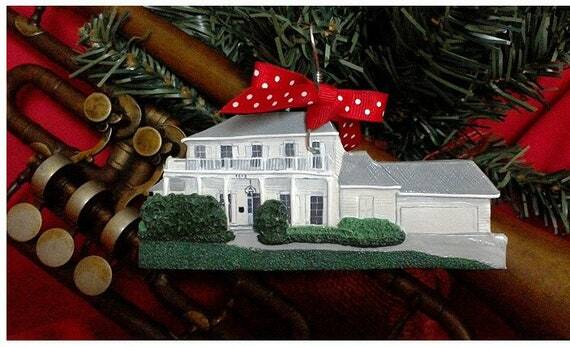 The ornament below comes with plaid, white or burlap ribbon for an added special touch. Update: I actually ended up purchasing this personalized ornament for my niece. The seller shipped the product very promptly, and the quality was wonderful…just as pictured in the photo! If your couple is newly engaged but not married by Christmas, you can give them a gift that will build anticipation for their wedding day. 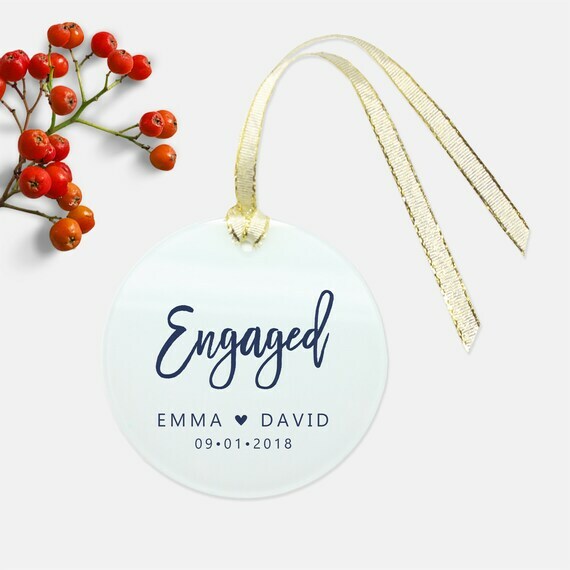 When my husband proposed, he used an ornament similar to this one to pop the question! This affordable farmhouse-style ornament comes in aluminum or ceramic, and the seller has a five-star rating with over 5,600 reviews! 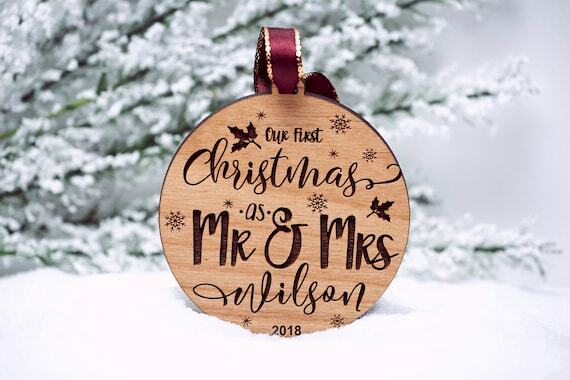 The muted colors in this wooden ornament blend well with most styles, so I’d call this a safe bet if you’re unsure about the happy couple’s home decor. Don’t you love those fancy fonts? 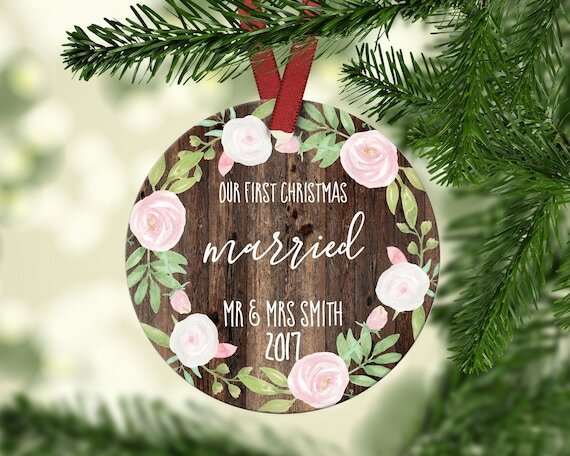 Etsy offers several options for more formal or intricate newlywed ornaments like the ones below. This custom replica of a house has “newlywed couple” written all over it! I’m amazed at the detail on these made-to-order polymer clay ornaments. The shop owner also notes that you can buy these as tree ornaments or even as magnets. 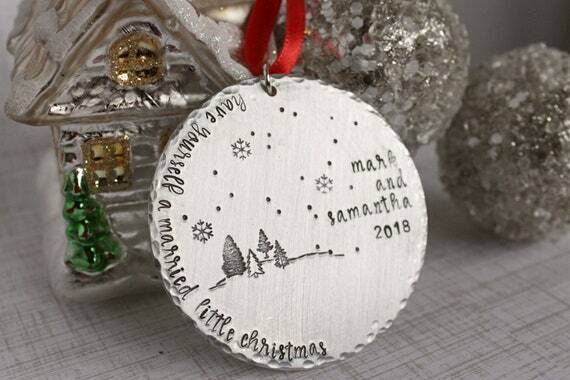 These aluminum hand-stamped ornaments offer a more formal appeal and also coordinate well with any decor. 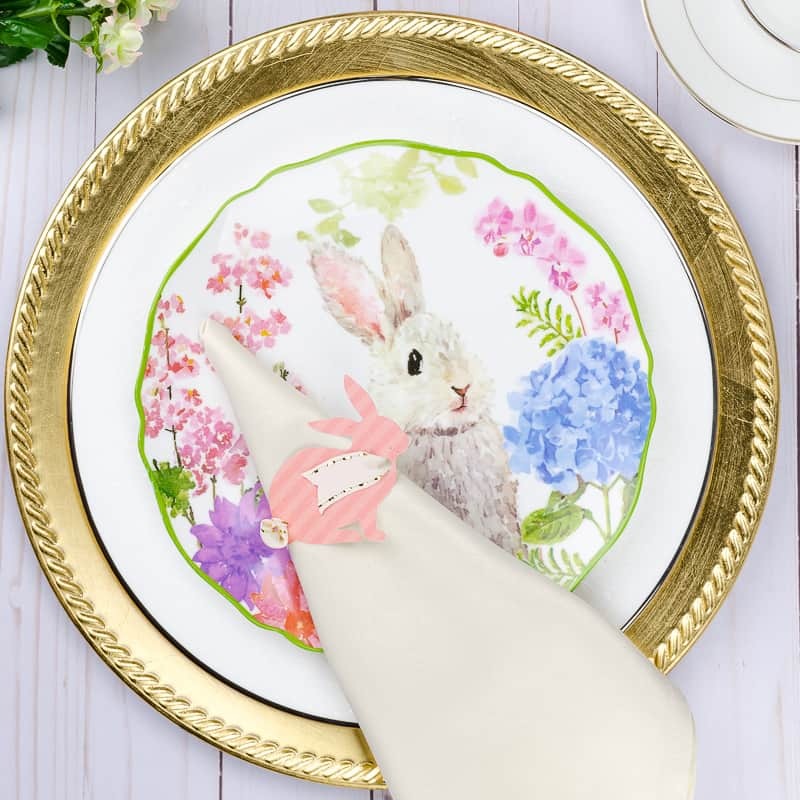 These make great keepsakes for newlywed couples. In many cases, you can customize the ribbon that comes with the tree ornament. 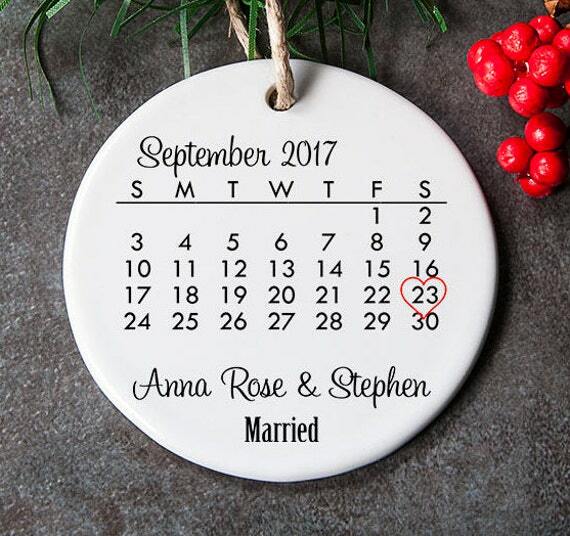 Some ornaments like this one can include date of the wedding in the design. If newlywed ornaments don’t ring your bell, try these other wedding gift options for Christmas. 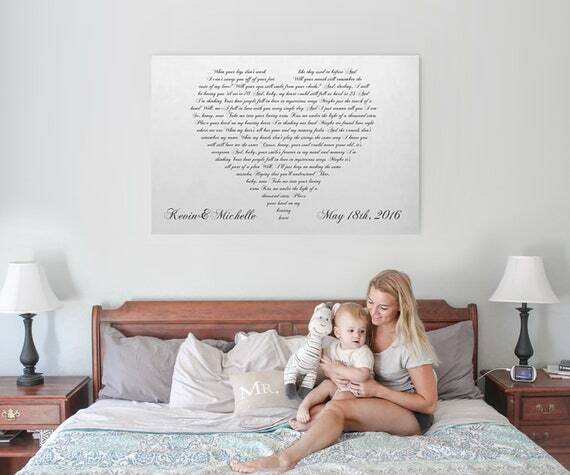 Hop on the canvas art train with this beautiful keepsake that places the newlywed’s first dance lyrics into a heart shape. I could picture this over a couple’s bed or above a sofa in a living room. 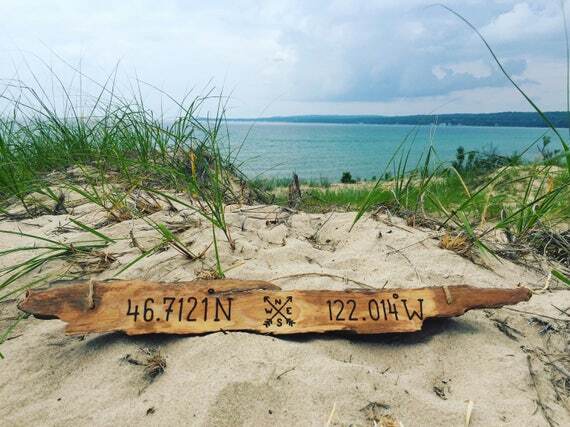 Whether or not your newlywed couple had a beach destination wedding, this driftwood sign would make a thoughtful Christmas gift. It has such rustic charm, which is all the rage these days, especially among millennials. 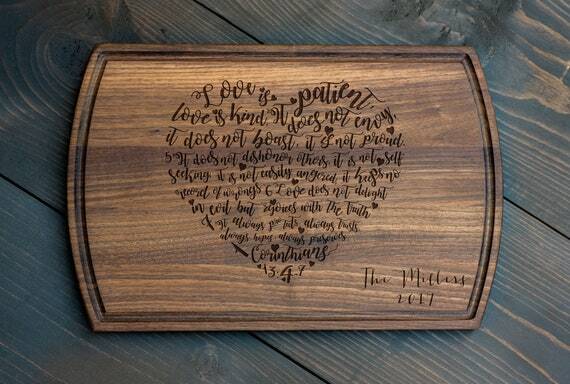 I have personally ordered Etsy cutting boards or cheese boards as gifts for married couples. 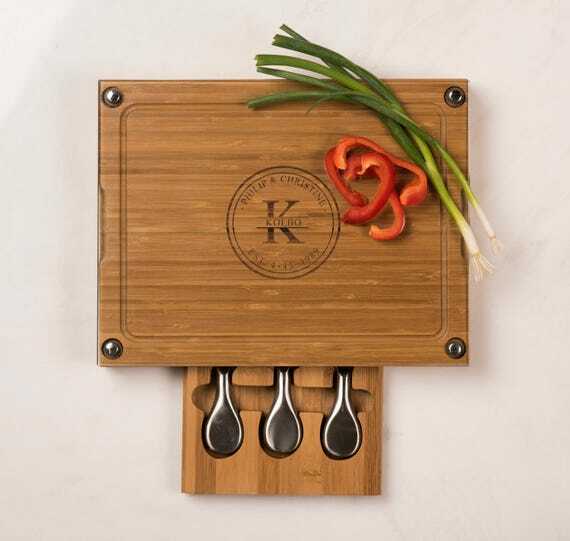 These commemorate the special day and come in handy in the kitchen. The second set with cheese knives is simply stunning. Don’t forget to pair the cheese with some wine! 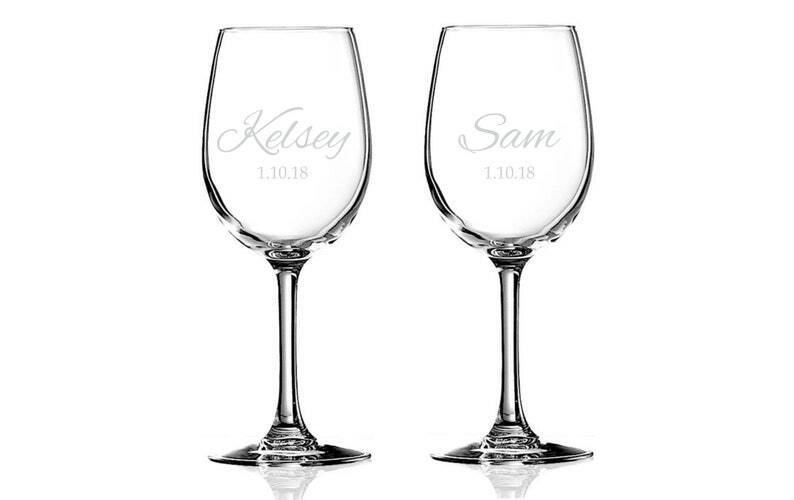 These engraved wine glasses will help the happy couple commemorate their special day for years to come. 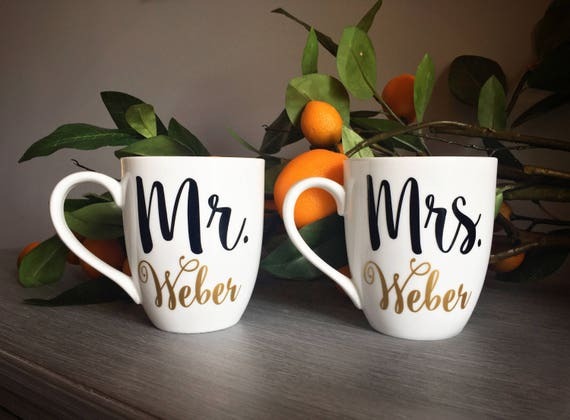 You can also help the newlyweds enjoy a cup of coffee or tea with these “Mr. and Mrs.” mugs. These make great stock stuffers, too. 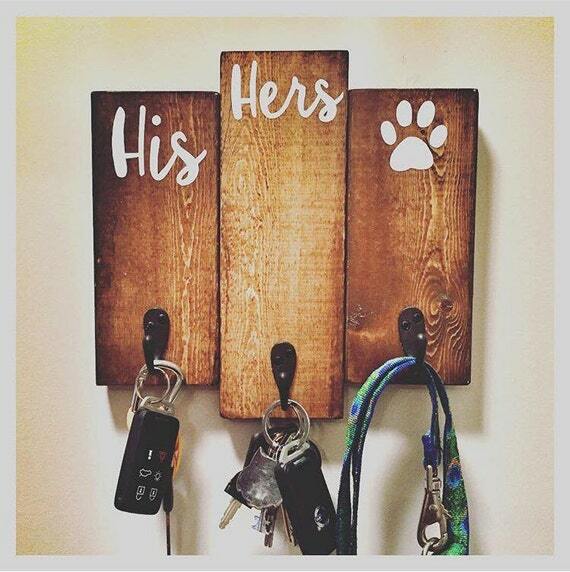 If your newlyweds own a dog, this key and leash holder would make an excellent Christmas gift! Order Deadlines: As mentioned earlier, it’s important to place your customized Etsy order by the first week in December to guarantee delivery by Christmas. 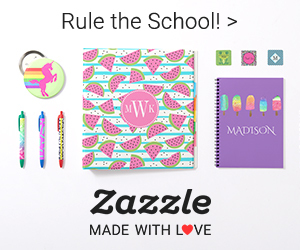 Personalization: Usually, when personalizing a gift, the seller doesn’t offer refunds. Make sure you double-check names and dates when placing a customized order. 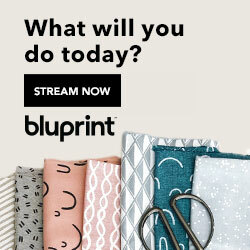 Reviews: Pay attention to reviews when selecting an Etsy vendor. Most shops will have reviews from customers with verified purchases. Gift wrapping: When ordering a gift close to Christmas, you may want to compare gift-wrapping options. Having your gift sent directly to the married couple will make it easier for you, and not having to wrap one more gift is an added bonus. Gift card: If you can’t decide what to order for your recipients or have run out of time, consider ordering an Etsy gift card. The couple can then choose a personalized gift that fits their needs. 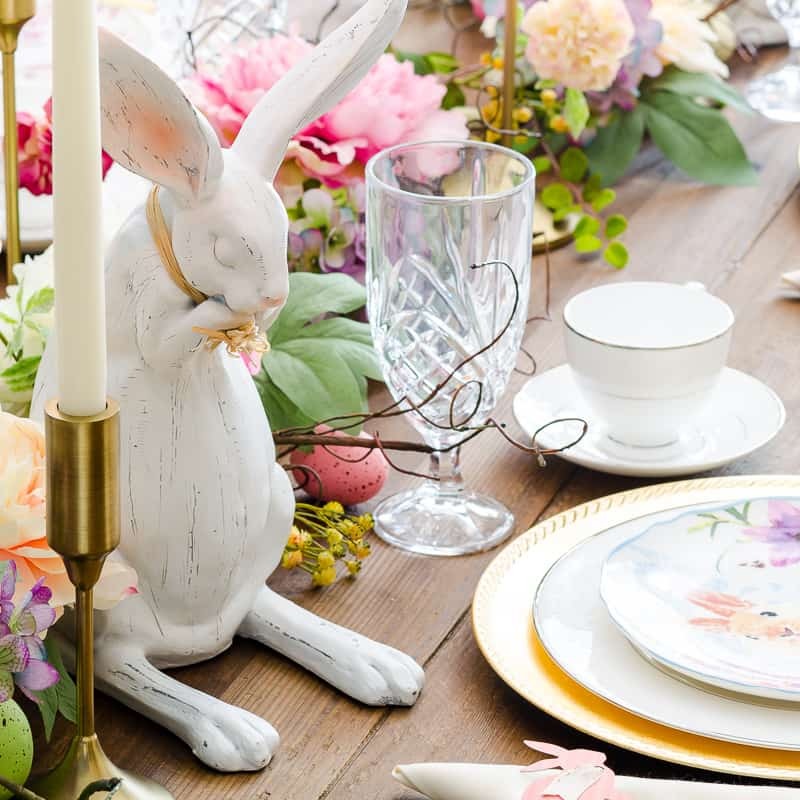 For more gift guides, craft projects and other inspiration, please consider signing up for my newsletter or following me on Pinterest. Very cute ornament ideas! I especially love the farmhouse ornament. Thanks, Lauren! I’m not sure if I can even pick a favorite. They’re all so cute. This is a really good post! 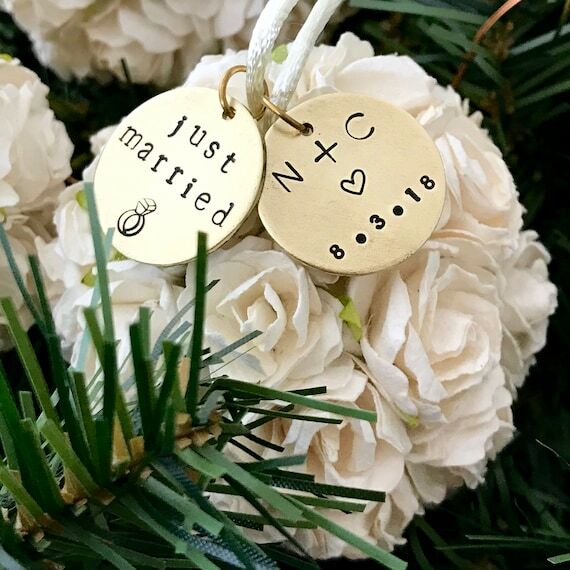 I love the thoughtful tips you give us at the beginning, and the wonderful variety of options for a newlyweds’ first Christmas ornament! Thank you! Thanks, Christene! 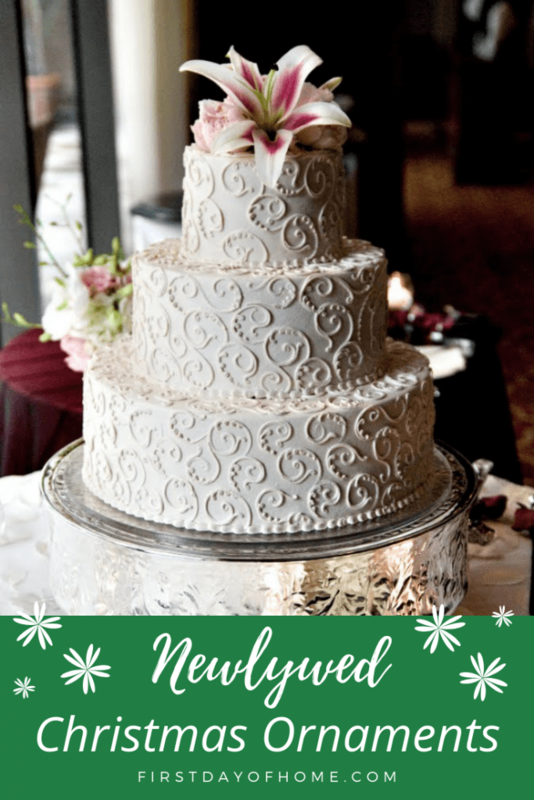 We have a wedding cake ornament with our wedding date on it, too! I love Etsy handmade items. Such cute ideas I never would have thought of for newlyweds. So glad I read your post Crissy! Thanks, Michelle! ❤️ I always manage to find inspiration on Etsy for things like this.